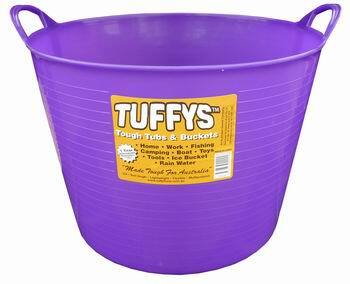 These are Australia's toughest flex tub. Great for Storage, Camping, Washing, Horses, Gardening..... 1001 uses. 100% Australian Made & Owned.Massive 5 Year warranty against breakage. Bulk orders and enquiries welcome. Buy direct from the manufacturer. These are Australia's toughest flex tub. Great for Storage, Camping, Washing, Horses, Gardening..... 1001 uses. 100% Australian Made & Owned. We are so confident in the quality of Tuffys we offer a massive 5 Year warranty against breakage. Bulk orders and enquiries welcome. Buy direct from the manufacturer. Check out the Video.